It's 1806, England is beleaguered by the long war with Napoleon, and centuries have passed since practical magicians faded into the nation's past. But scholars of this glorious history discover that one remains: the reclusive Mr Norrell, whose displays of magic, raising a woman from the dead and summoning an army of ghostly ships to terrify the French, send a thrill through the country. 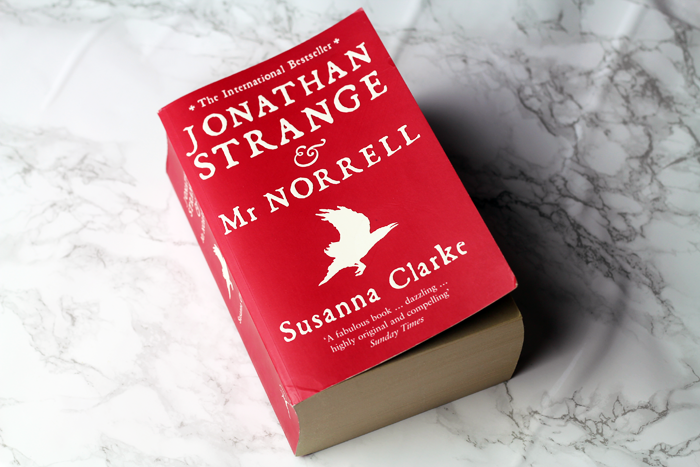 Yet the cautious Norrell is challenged by the emergence of another magician: the brilliant novice Jonathan Strange. Young, handsome and daring, Strange is the antithesis of Mr Norrell. So begins a dangerous battle between these two great men which overwhelms that between England and France. And their own obsessions and secret dabblings with the dark arts are going to cause more trouble than they can imagine. Now is that a synopsis or what?! This was published back in 2004 when I was still in the grasp of what I now refer to as my 'lost reading years' so I'm very pleased that it hasn't passed me by completely because I bloomin' love anything magic. It has been made into a TV series (that starts on Sunday on BBC One!) and after seeing a few teaser adverts I googled it, saw it was a book, and promptly bought a copy. It's a pretty hefty book at over 1000 pages, but it's not intimidating. I'm quite a way in and it doesn't feel like it should end any time soon, nor does it feel like I've been reading it for forever. I don't read a lot of long novels, mostly holding the belief that many are perfect at around 200 pages, but some stories definitely demand length. I'm a fairly fast reader (not always a good thing, I'm constantly reminding myself to slow down!) and it's been really nice having a world I've been able to dip back into more than a few times before finishing it. It's been a real experience so far, I have no idea what's going to happen, but I have a feeling it's going to get really good and gain momentum towards the end. Jennie, I've had this book on my book shelf, the exact same copy as yours for what must now be over five years. I just have never got around to reading it, it's funny how the weeks/months and years go by! I too saw the advert on TV and think it looks so good so I should imagine that the book will be even better. I've being looking for it for the last few days but I now cannot find it anywhere. Since moving house a few things have got misplaced, I'm worried it's in a box somewhere in the garage. The hunt continues. I don't mind a really long book to slug through every now and then. I'll keep this one in mind! I've always wanted to read it but somehow everytime I'd to the library, I would walk out with something else :) Let us know your thoughts on it when you're done :) I'm currently reading Ficciones by Borges and I'm enjoying it so much! I've had this on my 'to read' list for the longest time, this post is inspiring me to bump it up the list a little! I'm currently reading 'The Goldfinch' and absolutely adore it so far! Argh! Such a good book, it was one I had tried to read repeatedly but couldn't quite get into until I took it on holiday and just read it on the plane for a few solid hours. I think it just took me a while to cotton onto the idea that making it half fiction/half history and part novel part historical account was very clever. Even though it is such a massive hunk of book and carrying it around is exhausting I really felt that Clarke's world building and scope worked so well that it wasn't at all tiring to read. I was shocked when I found out this was her debut and more than a little sulky that I didn't have more Clarke to consume when I'd finished, there's a few short stories about the place and rumour has it she's working on a second book set in the same world but if it's anything like as long I won't be at all suprised if it takes another 10 years to finish. Sorry I've really rambled on here, it's just one of my favourite books and convincing people to read a 1000+ page book that I freely admit took a while to hook me is often a losing battle so I never get to talk about it. This seems to have always been on my radar, but I've never picked it up. I am very much intimidated by long books! It does sound brill though, and so does the BBC adaptation! I'm about to start reading Emma. Can you believe I've never read it? It sounds good but I can't bring myself to read such a long novel! I'm currently reading One Day by David Nicholls. It's a bit of a monster! I'm currently reading The 100 Year Old Man that climbed out of a window and went on an adventure (ridiculous title) but I have to say I'm only 'sort of' enjoying it. I like the sound of Strange and Norrell and the TV adaptation looks amazing. This might just have to go on m y list. Ooh Jennie this sounds right up my street! Great to hear that it's being adapted to will have to look out for that :) I'm currently reading The Museum of Extraordinary Things, a bit slow at the minute but I'm hoping it's going to get going soon!